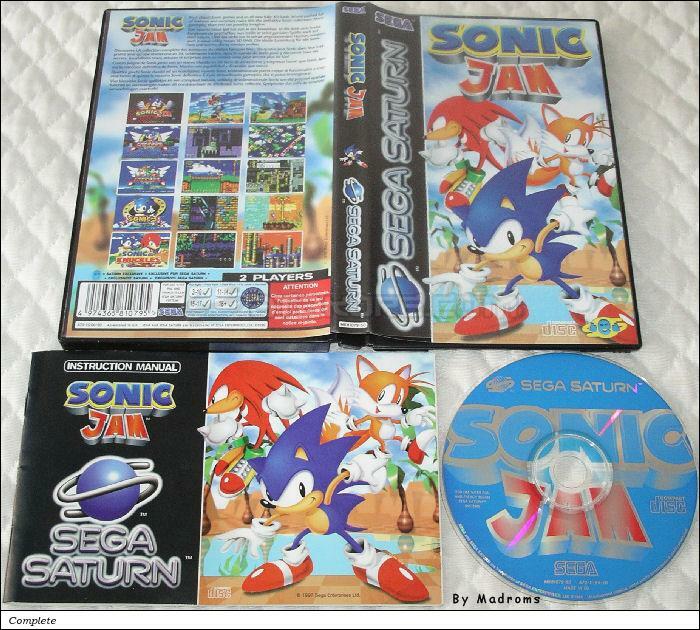 Sonic Jam is a Compilation - Action game, published by Sega Enterprises, Ltd., which was released in Europe in 1997 for the Sega Saturn. At the first sight, Sonic Jam could be considered as an easy made Sonic compilation, this would be a mistake. It contains the fourth first installements of the series. The versions are extremely close to the original ones on every aspects. The devellopers didn't forget Sonic & Knuckles lock-on feature that allow you to combine the games together exactly in the same way as you did on your beloved Megadrive. Those four games are visually out of date to nowadays standards but can be considered as some "16-bit plateformer" references and looks really good if you are in the 2D thing especially according to their fluent animation. The added value of this disc consists in a 3D world which stands as a very complete museum about the saga, including commercials, digitalized instructions books & covers (shame on the occidental variations), a detailed timeline and some minigames to enjoy this 3D world. Also note the magnificent packaging of the game.